Service to Mudge Way via Glen road has been restored with Services operating from Sandy Road Plympton to Mudge Way then into Woodford before continuing to the City Centre via Lipson Vale. On most journeys once the bus has reached the City Centre will continue as the Service 42 to Derriford Hospital. Other changes to the Service 20 include the introduction of a Sunday day service and the routing of the Service to operate from Strode Road then Glen Road to Mudge Way thus restoring a number of local links to Woodford. The route remains unchanged with the exception that on approach to the City Centre the Service will operate via North Hill and Mayflower Street instead of North Road East. However, these timetables have been re-timed to improve reliability. These Services together will continue to provide services every 10 minutes Monday to Saturday with evening services operating every 30 minutes Sunday to Saturday and every 30 minutes during the day on Sundays. These changes will see the return of evening Sunday services to Southway on 40/41. 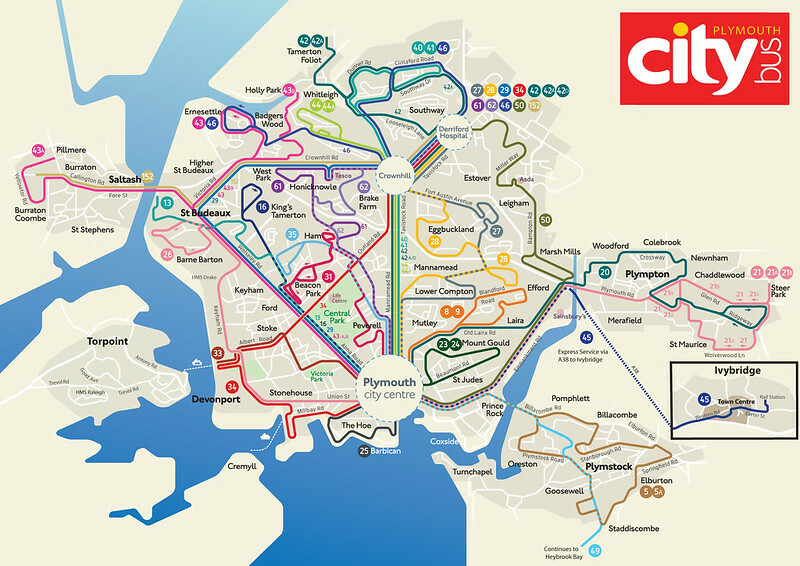 There is a new updated map on the Citybus website, as some things have changed since that map was published. The new timetables (printed versions) also make reference to 'plymouthbus.co.uk/fares' - this page doesn't currently exist though at the bottom it says 'all prices etc valid at 11th November 2012', so presumably this will be a page full of fare charts for every route. The new timetables have plenty of adverts for the mobile app and a whole ton of QR codes, plenty of usage of the new logo and a whole new look to them. Each timetable also features a full-size network map on the back - a very good idea, for example if someone catches service X to place A, and then realises they need to go to place B, they can look at the map on the back of the timetable and work it out from there. If anyone at Citybus is reading this, a big well done! Very impressed. Caught the 43A last night and was impressed to see the driver handing out timetables to all that got on/of in Saltash!